Improved Initiative: The Legend of Conan, Coming Soon! Conan is perhaps one of the most iconic characters in the world of fantasy. Most of us have, at some point or another, tried to emulate the model set forth in Robert E. Howard's stories for a barbarian (whether we knew we were doing it or not), with varying degrees of success. An archetype that pre-dates Lord of the Rings, Conan's mythos has been contributed to by famous authors like Robert Jordan, as well as some other big names. 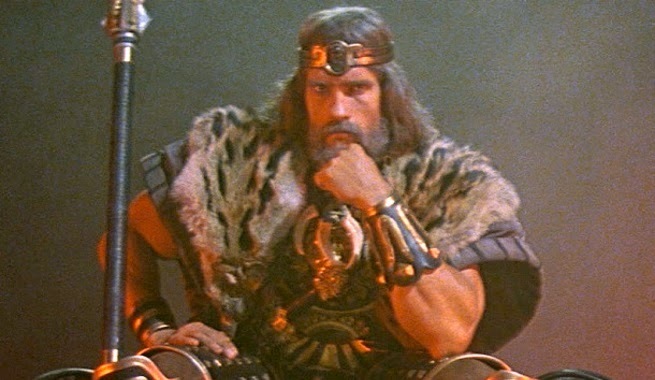 While a lot of gamers have devoured the tales left by Howard and his successors, perhaps the biggest exposure Conan received was in the 1982 film Conan The Barbarian starring Arnold Schwarzenegger. The movie was a blockbuster, but it also brought the epic feel of Howard's world to the big screen on a scale and grandeur that's never been truly repeated. Doesn't mean they aren't going to try, though. Conan gained his initial fame through serialized pulp fiction stories in magazines like Weird Tales, and the goal with his film franchise was originally to do something similar. The people behind the movie wanted to create a sword and sorcery James Bond, whose stories weren't a series in a traditional sense, but whose career as an adventurer we could follow until he had trod the kingdoms of the earth beneath his sandaled feet, and sat on the jeweled throne of Aquilonia. As most of you know the second movie was kind of a bust, and Conan lay dormant for many years after that. Until recently there were stirrings of Schwarzenegger returning to one of his most iconic roles, but now according to this source it seems that Legend of Conan is just over the horizon! While we've skipped the meat of Conan's life as an adventurer, this story picks up where the novel Conan the Destroyer began; with Conan as king, and who is looking for a last adventure so he doesn't fade away like the besotted King Osric (the king played by Max Von Sydow in the original film). While Arnold is trying to breathe life back into many of his iconic roles, it's possible that his age and experience will be his greatest strengths in Legend of Conan. It seems we'll have to wait a little bit longer, though. If you're a big Arnold fan, then check out this list of True Facts About Arnold Schwarzenegger. As always, thanks for stopping in. If you'd like to support Improved Initiative then visit The Literary Mercenary's Patreon page and become a patron today! Also, if you want to keep up on my latest posts and updates then make sure you follow me on, Facebook, Tumblr, and Twitter as well.